I have finally made something other than fabric post cards! 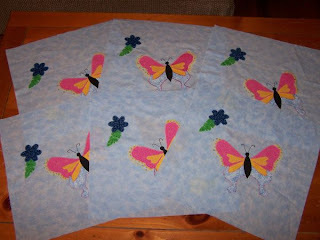 12 butterfly quilt blocks. These will be swapped with other ladies from IFQ. I made two different sets of six to swap. I enjoy this kind of swap. It's fun to send out my blocks that are the same and get 5 totally different ones back. 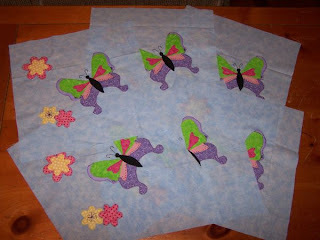 When they all arrive I plan on putting them together to make a quilt for one of the twin beds in the house.